Some testers noted that the Adidas Adizero Boston Boost 6 was adequately lightweight. The word ‘comfortable’ was used by many runners to describe this running shoe. A user wrote that the fit was great in the forefoot, mid-foot, and heel sections. There were comments about the mid-sole cushioning system, which, for runners, was easily able to cushion the heel-strike. The quality materials used in this model made it responsive to the movements of the foot, stated a reviewer. A lot of users were satisfied that it came in sizes that fit their usual preferences. It was versatile as a trainer and as a racing shoe, according to a reviewer. A reviewer noted that the tongue of the Adizero Boston Boost 6 folded over distractingly. The color of the product was brighter for some testers who had it delivered, and they felt that it was a bit disconcerting. It felt a bit tight for one runner. Runners were generally impressed with the Adidas Adizero Boston Boost 6. It was able to deliver solid performance and service to them. The cushioning felt adequate and the quality of the materials was sound. A few caveats were made about its looks and its supposedly distracting tongue, but that didn’t stop the athletes from enjoying this neutral shoe. Shoes best for road, track and light gravel. See the best road shoes. Shoes best for trail, off road, mountains and other unstable surfaces. See the best trail shoes. As long as you stick to the road or path, and if you want just one running shoe, buy a road running shoe. Shoes for runners who do not need any additional arch support (Around 50% of runners). Best for people with normal, high or medium high arches. See the best neutral shoes. Shoes for runners who need mild to moderate arch support (Around 45% of runners). Best for runners with a low arch. See the best stability shoes. Shoes for runners who needs a lot of arch support. Best for runners with flat feet. See the best motion control shoes. - Rule of thumb: If in doubt, buy neutral shoes to avoid injuries. - More about arch support in this video. - Find your arch type by following steps from this video. Cushioned shoes for your daily easy running. Great comfort. See best shoes for daily running. Lightweight shoes good for races, interval training, tempo runs and fartlek. Here are the best competition running shoes. If you want just one pair of shoes, buy a shoe for daily running. The height difference from the heel to the forefoot, also known as heel drop, toe spring, heel to toe spring or simply drop. There are many opinions about what a good heel drop is. We do not recommend any in particular. Lean more in this video. Experts are runners, who post reviews at youtube, directly at RunRepeat or at their own websites. Each expert is categorized from level 1 to level 5 based on expertise. See stats on expert reviews and how we calculate scores here. Are you an expert? Apply to contribute here. The Adidas Boston 6 is an extremely versatile shoe in my opinion, whether is it trying to achieve a new PR or doing a tempo run this shoe is up for the job. The reason why I bought this shoe is because I required a lightweight trainer to train in. The shoe is responsive and would suit runners with a midfoot strike very well. The thing that drew my attention when I saw the shoe was the looks. In my opinion the shoe looks quite decent and I have been able to use it for casual wear. Besides it is comfortable enough for me to wear it for a whole day without any discomfort. The Boston 6 is not exactly a shoe that is meant for street wear, however, I feel that it is a shoe that can be used for this purpose. The boost foam that is used on many Adidas shoes now is the thing that really blew me away. Before owning this pair, I constantly hear my friends rave about how magical the boost foam is but I was skeptical about it. My opinion on the boost foam has changed ever since I started using this shoe during training sessions. In previous my previous shoe, the Mizuno Wave Hitogami, I would often complain about doing drills on concrete as the eva foam used didn’t provide the cushioning I wanted. For Boston 6, I have not experienced any discomfort. The foam used offers adequate cushioning for long runs and is also responsive enough for me to do tempo runs and time trials on the track. The upper of the Boston 6 is one that love. It is a breathable mesh that is highly appreciated in the hot and humid weather of the tropics. The upper of the Boston is very comfortable because it does not restrict the movement of the foot. It does not have any welded overlays on the front part of it. I was slightly worried that the lack of welded overlays on the show would affect its durability. I was surprised that it is still holding up quite well even after training so much in it. The upper shows very little signs of wear even after doing roughly 150 km in it. Another thing I like about the upper is the lacing system. The lockdown the lacing system provides is something that I love about the shoe. The laces that are connected to the overlay keeps my feet in place and stop them from sliding. This lacing system has also given me the freedom to adjust the fit the shoe provided. Although I enjoy the fit the shoe provides, the way the shoe is built has also given me problems with the tongue. Also it is worth to note that the tongue tends to fold upon itself in the middle of runs. This has led to some slight discomfort but it has not led to any major problems when training in the shoe. One thing that has bothered with this shoe me are the laces. The laces on this shoe are too short. It is quite an irritating problem as it is very hard to tie the shoe when I lace the laces to the last eyelet. This has led me to tighten the laces which is quite uncomfortable, especially when I am using the shoe during training. However, the laces do not get undone easily. The rubber on the sole of the Boston is very grippy. The continental rubber used on the shoe performs well in all surfaces and conditions . This allows me to focus on doing my best in runs instead of having to pay attention on the surface that I’m running on. Besides being very grippy, the rubber is also very durable. There is very little sign of wear on the rubber although I do a lot of training on gravel which have destroyed many of my racing flats. I also do have to commend the shoe’s ability to handle wet surfaces. The rubber hasn't failed me on wet pavements and is currently my go to shoe for wet conditions. The shoe does perform well on most surfaces and even on light trails. 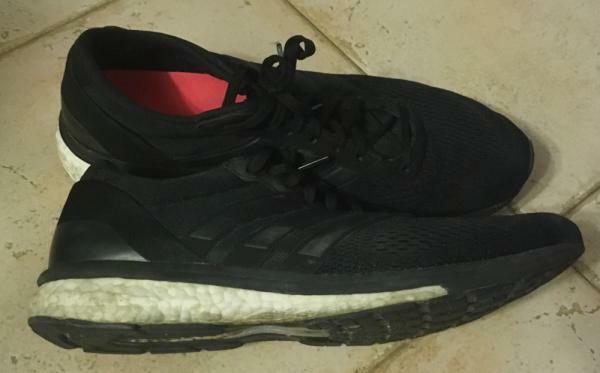 For the most part, the shoe is responsive but it is still relatively cushioned and allows me to have feedback from the ground. I definitely look forward to training in this shoes. They have been a joy to train in and have never failed me by providing consistent performance ever since they came out of the box. The Boston boost is a very versatile shoe that allows me to run with confidence in all conditions. This lightweight neutral trainer allows me to do most of my workouts in comfort in the hot climate. The shoe however, is slightly tight even though I bought it half a size up from my street shoe size which is where it lost some points. Still, it could probably just because I have wide feet. All in all, I am very satisfied with the way the shoe has performed. The reason why it lost some points was mainly due to the tongue folding on itself and the laces being too short. However these problems are not major and only cause some minor discomfort. This expert has been verified by RunRepeat. Reviews are neutral, unbiased and based on extensive testing. I bought my first pair of Adizero Boston Boosts on sale. They were very different from the shoes I had been wearing - a lot less cushioned but I thought I would give them a go as they were such a bargain and looked great of course. I had previously read reviews that mentioned shoes being "responsive" at the time I felt this was a daft thing to say. What do these people think they are reviewing, a car? Surely it is the runner, not the shoe that is responsive. However, after one 5k in the Boston’s, I was converted and understood what reviewers meant by pop and return. I have particularly noticed this on a fast course where you have sharp changes of direction (such as round the end of an out and back). They are a snug fit but not overly narrow. I have wide feet and struggle in getting a comfy fit. I often have to go size up by half a size. Boston boosts are not roomy, but they are quite rounded and don’t have any overlays or extra material over the toes (the Boston 5 which I have since tried have a suede toe that makes it seem less roomy). The mesh of the upper is also stretchy and flexible. The combination of these things helps not to overly restrict your toes and give you some wriggle room. It also gives a snug fit, well around the ankle and doesn’t slide around. This is a pet hate of mine when my heels seem to be sliding around the back of my shoe. I tend to use heel lock lacing but don’t need to with the Boston 6. They look great. They are unfussy, a little retro (yes, I am a child of the 70), and they come in a wide array of colorways. I am very conscious with so many other trainers that my there seems to be a lot more shoe that my foot and they feel clumpy. Not so with the Boston 6. While they are far from minimal, they are very light; you just don’t know they are there. The Boston 6 is my favorite shoe by far. When I first bought them, I kept them for shorter, faster workouts up to 5k. I thought that they wouldn’t have enough cushioning for longer distances. Then snuck up to 10k, then 10 miles half marathon and had no problems. In the run-up to my first marathon, I searched and searched for shoes that would be "like the Boston Boosts but a bit more cushioned." Six new pairs of running shoes later and none of them matched up, so the second pair of Boston 6 was purchased to see me through my 26.2. My first pair of Boston Boost 6 has now clocked up 500 miles. While the outers no longer look box fresh, they are holding up extremely well, and there are minimal signs of wear on the soles. I bought a second pair as my race day shoe, these are up to 135 miles now, and there is no noticeable difference running in my older and newer pairs. The older pair still seem perfectly snappy and responsive. I just like to have a smarter pair for race days. I really had no excuse for buying a third pair yet, except that they were in a nice colorway that will go great with my club kit. So pair three are patiently waiting for their first race. I find it hard to find something that I don’t like about the Boston Boost 6. I’ve had no issues with them at all. Even after half marathons and a marathon, I’ve had no toe squishing, bruising or blisters. There have just been a couple of occasions on very cold and wet days when I have found the boost foam to be quite hard underfoot at first. It almost feels like the insoles have shrunk a bit, but all seems to return to normal once the Boston 6 and I have both warmed up. I haven’t found anyone else reporting this issue so it could be just my imagination or my feet! The new Boston lightweight trainer/racer—which has Boost foam for the first time—is the consummate 10K to marathon racing shoe. Runners should expect this to be soft against the foot and be a little more forgiving than the fit has been in the past. The Boost mid-sole is a foam unit that’s efficient in delivering responsive cushioning and shock absorption. This foam is made from individual pellets that, when clumped together, bring a well-cushioned and soft platform. This lightweight running shoe uses high-quality materials that make it more efficient when it comes to long-distance races and intense training. The outsole is resistant to wear & abrasion, the midsole provides long-lasting cushioning and stability, and the upper is breathable & comfortable. Mesh material is used for the men’s version while a knitted upper fabric is featured in the women’s version. Both of these versions encourage air to seamlessly enter the shoe and keep the foot cool and dry. The Adidas Adizero Boston Boost 6 has been optimized for racing, but it’s also a great option for training and other athletic activities. Its supportive mechanics are consistent and its comfortable components remain efficient even after many uses. The 6th iteration of the Adidas Adizero Boston Boost has a standard running shoe length, which is different from the previous version. It comes in a variety of sizes that adhere to the preferences of runners. Its width runs from medium to narrow, so it’s more aimed at runners who have narrow or medium-sized feet. Its low volume construction makes it more responsive when used for racing and training as it doesn’t restrict the natural movement of the foot. The AdiWear tech is a rubber material that is non-marking. Located in the heel area, it provides traction and durability that combats wear and tear. Continental Rubber is one of the most reliable components when it comes to outsole units. This rubber compound offers traction over a variety of surface conditions, even wet ones. So, runners get more confidence when running in puddles or slippery floors. The Boost foam is one of the Adidas technologies that provide responsiveness, shock absorption, and support to the underside of the foot. It’s made from Thermoplastic polyurethane, a durable yet pliable compound that doesn’t easily break down or wear off. The underfoot platform becomes more comfortable and springy because of this non-restrictive foam. 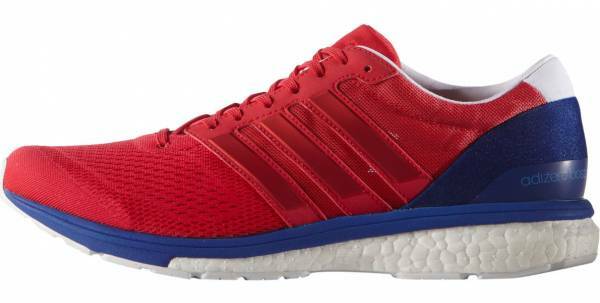 A number of Adidas running shoes also possesses the Boost foam, including the Adidas Pure Boost. A thermoplastic unit in the mid-foot area stabilizes the foot and leads it toward a better stride. This Torsion System runs from the heel to the middle area of the shoe, making sure that each transition through the gait cycle is smoother and more efficient. Open mesh makes up the upper unit of the Adidas Adizero Boston Boost 6. The men’s version uses a net-like design for the upper. For the women’s version, a piece of knitted fabric is placed. They both deliver exceptional breathability and they wrap the foot snugly, yet comfortably. The Coolever Mesh Lining manages moisture and heat. It doesn’t make the interior stifling even when the wearer uses the shoe for extended periods of time, making it a great inner lining for long-distance races. The traditional sock liner adds a bit more cushioning to the runner. It’s not too thick, but it’s supportive enough to keep the foot more comfortable when stepping on the shoe’s platform. Directly connected to the lacing system, the stitched-on overlay system helps the upper when hugging the foot and keeping it in place. When the shoelaces are adjusted the upper fabric follows suit, making the fit customizable.